“We think 2016 will be the year of the sedan!” Senior VP of Marketing and Operations Fred Diaz declared minutes before pulling the wraps off their new, mid-level people mover. He’s wrong, but this car is absolutely worth your attention anyways. While not the most glamorous of their offerings, the Nissan Sentra life is a good one. Nissan claims that 93% of all the Sentras purchased in the last 10 years are still on the road which, if true, means the little four door is well worth the price of admission. 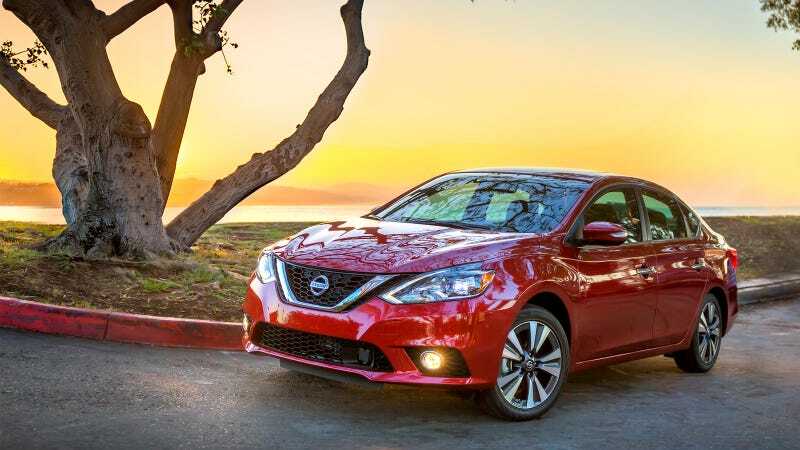 To keep the Sentra current for the next 10 years, Nissan have given it a moderate overhaul; redesigning the exterior, interior, safety technology, and by updating the suspension. The 2016 exterior has been updated to bring it more in line with the Maxima and Altima. The fascia, grille, fenders, and hood are all new, as are the boomerang shaped headlights. LED lowbeam headlights with LED accents are available on the Sentra SL and SR models, as do two new 17-inch wheel design options. Out back, the Sentra gets a new fascia as well as boomerang shaped taillights which Nissan hope will give it a more premium looking appearance. Inside the cabin there’s a new steering wheel, center cluster, console, and seat fabric. A new, higher resolution TFT LCD panel provides the driver info, and the SL, SR, and SV models get a 5 inch Advanced Drive Assist Display between the analog tach and speedo. The most important update to the Sentry lines comes from a host of optional safety technology options. Depending on trim, the new Sentry is available with Forward Emergency Braking (FEB), Intelligent Cruise Control (ICC), Blind Spot Warning (BSW) and Rear Cross Traffic Alert (RCTA). The 2016 Sentra has a base MSRP of $16,780 for the manual (!) Sentra S, while a Sentra SV with NissanConnect (nav and mobile apps), blind spot warning, and rear cross traffic alert will run you just under $20k. Full pricing on all trims and options will be out before the end of the year when the car goes on sale. For 20 grand, this is a lovely looking car that has a ton of additions and options that will keep it relevant should you drive one for the next 10 years. Contact the author at sean.macdonald@jalopnik.com.